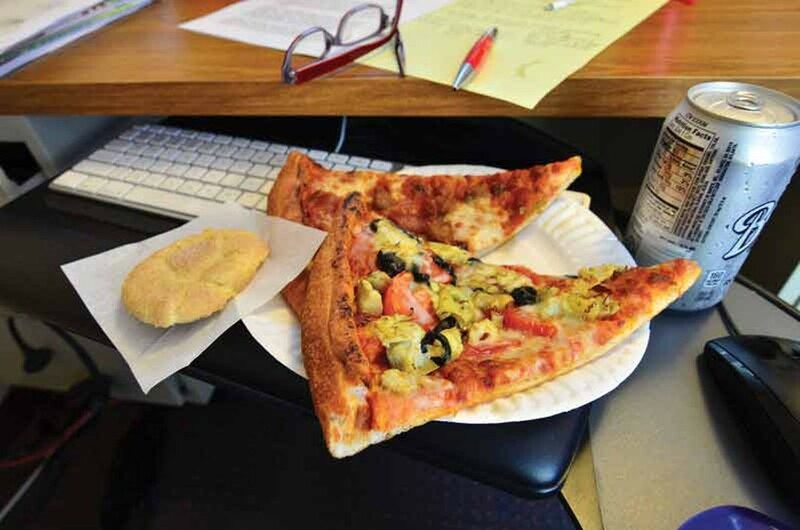 A desk-appropriate lunch with a cookie. A good meal under $10 is a frugal find, and the legwork, trial and error it takes to find one can give you a tummy ache. Now that the students are back in town, it's easier to just follow the crowds between classes to the dining deals. It's not like you're looking at someone else's paper. Back in grad school, a friend with dubious taste and a wallet as empty as my own steered us to what he claimed was, pound for pound, the cheapest pizza in the city. Our dollar slices draped like beached manta rays over our paper plates. After we folded them to take our first bites of the rubbery expanse, I realized the manta ray would have tasted better. Adjusting for inflation, Smug's Pizza (626 Second St., Eureka; 1034 G St., Arcata; 2720 Central Ave., McKinleyville) is nearly as cheap, but the slices are infinitely better. The pleasantly chewy crust is on the thin side — not supermodel thin, but not doughy — and can stand up to the sauce and copious goodies on top. It is what you want from a slice. The Double Deal comes with two slices, three toppings each, a soda and chips or a cookie for $5.50. A bargain, right? But the real star is the cookies which vary daily and are made from scratch right there — why would you get the chips? The snickerdoodle, dusted with cinnamon, crusty outside and still soft and buttery at its center, is a perfect example of under-the-radar decadence. Look past the pyrotechnic special rolls (deep fried, zig-zagged with hot sauce, piled up and sparkling with tobiko) and have a simpler sushi lunch now and then. Which is not to say you need to settle on a tragic little block of cucumber kappa rolls in the name of fiscal responsibility. 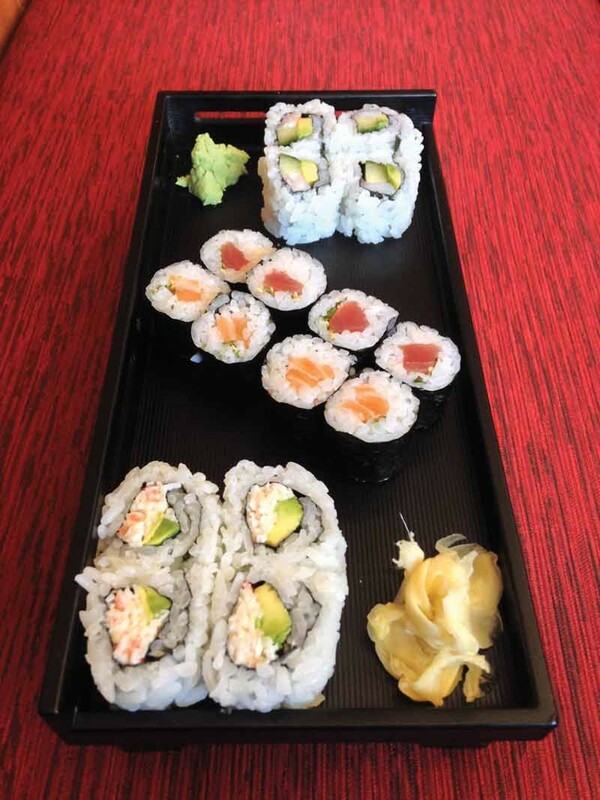 At Sushi Tao (768 18th St., Arcata) it's $9.50 for the 16-piece Stardust combination with California, shrimp and avocado, tuna maki and salmon rolls. These are slender, single-mouthful rolls that require no special effects. The rice is the work of pros, with just the right firmness and vinegar. Too often sushi comes so densely packed that you struggle to chew, but the rolls at Sushi Tao show a lighter touch with pieces that yield to the bite. The California roll is imitation crab (relax — look at the price again), the garnet red tuna is fresh and the salmon is striped with buttery fat. Can you afford to eat sushi today? Yes, you can. Japhy's (1563 G St., Arcata), which looks a bit like a funky cafeteria, is always brimming with students. And if a bunch of people who are otherwise living on instant ramen are willing to pay for noodles and soup, that's something. Stand by the counter for a while and you'll see bowl after bowl of Thai chicken curry go by ($8). On a recent trip, nearly every table had at least one person whose cheeks were growing rosy in the steam of the stuff. 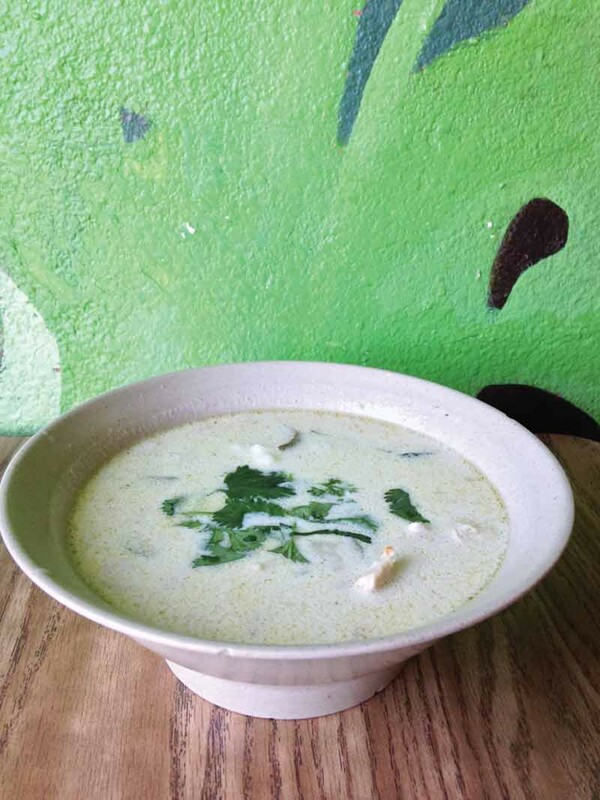 Not overly spicy, but creamy with coconut milk and fragrant with lemongrass and fresh cilantro, the soup has plenty of veggies and chicken. A scoop of hot rice dumped straight in and it's a stick-to-your-ribs meal (or two).